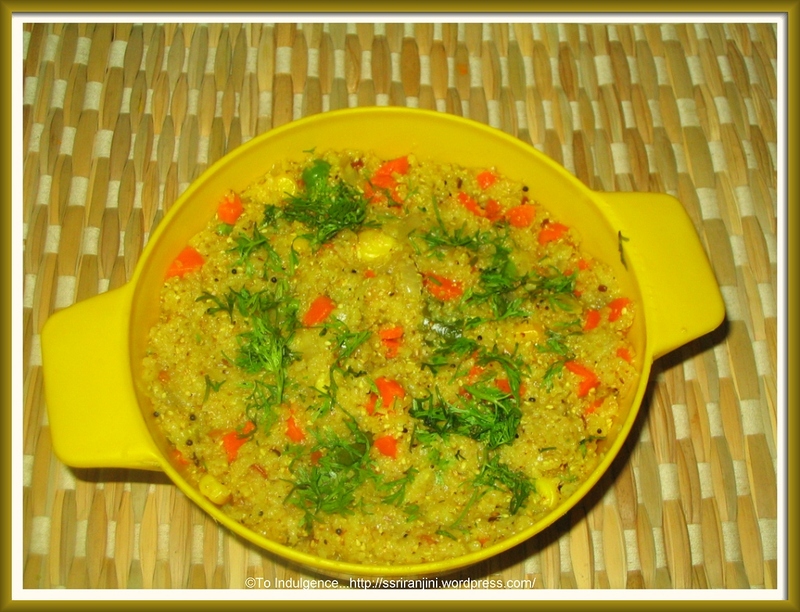 Sprouted Dalia is also known as Bulgar wheat or broken wheat. It is prepared after sprouting wheat of superior quality and then processing it on a solar-operated grinder, thus ensuring all the vitamins and minerals are well-preserved. When cooked, broken wheat has a very hearty, warm aroma and a grainy, delightful taste. It has a very good source of dietary fiber and manganese. It is also a good source of magnesium. Wash the dalia thoroughly. Blanch it in 2 cups of hot water for 4 minutes. Drain and keep aside. Heat the oil in a pressure cooker. Add the onion and green chilli and sauté till the onion turns translucent . Add the peas, carrots, dalia and salt and sauté for 3 to 4 minutes. Add 1 1/2 cups of water and pressure cook for 1 whistle. Garnish with the coriander and serve hot. 1. You can use any other vegetables of your choice. 2. You can use broken wheat instead of sprouted broken wheat. This dish looks delicious. I make this quite often for my husband who is a diabetic. You have got a nice blog. I keep visiting your blog. Thanks for posting useful information like the Measurement and Conversion table. Keep up the good work. A very healthy recipe, this is going on my ‘must-try’ list. Thanks Rupinder. 1/2 cup dalia will be approx 160 gms. This recipe is really nice. But is their any recipe to reduce belly fat. As I have gained in my second pregnancy.